As a registered member you can use the IPHM Approved badge for use on your website or blog page and are entitle to use the letters IPHM after your name. This demonstrates to your clients that you are a fully qualified practitioner and increases their confidence in you as their chosen therapist. Did you know? 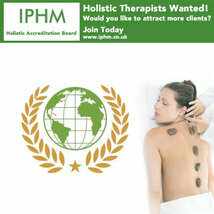 As a signed up member you can use the IPHM Logo on your website, stationery, or blog/social media pages.